As part of our Top Topic of “funding longer lives”, we recently launched a major strategic initiative focusing on how re/insurers can help ensure our ageing populations are financially protected. Our “ageing wallet” analysis looks at the different funding sources for income, health, care and inheritance of people aged over 65 in six major markets (Australia, China, Germany, Japan, UK and US). The analysis shows that, currently, re/insurance contributes only 5% to the global ageing wallet of USD 11 trillion. In all these markets, state funding remains the key funding source, although there are significant national differences. Growing life expectancy, increasing health and care needs combined with declining state support will make it difficult for current funding systems to meet the needs of seniors in future. Thus, there is a growing role and opportunity for the re/insurance industry to develop solutions offering financial protection to senior citizens. However, we emphasise that it is not enough for re/insurers to merely compete for market share with existing funding sources. In order to develop affordable, accessible solutions people want to buy, it is necessary to develop a good understanding of the various pathways to older age and the many different needs individuals have on that journey. We have presented our research in two reports and eight fact sheets, and have conducted a comprehensive media campaign around them. 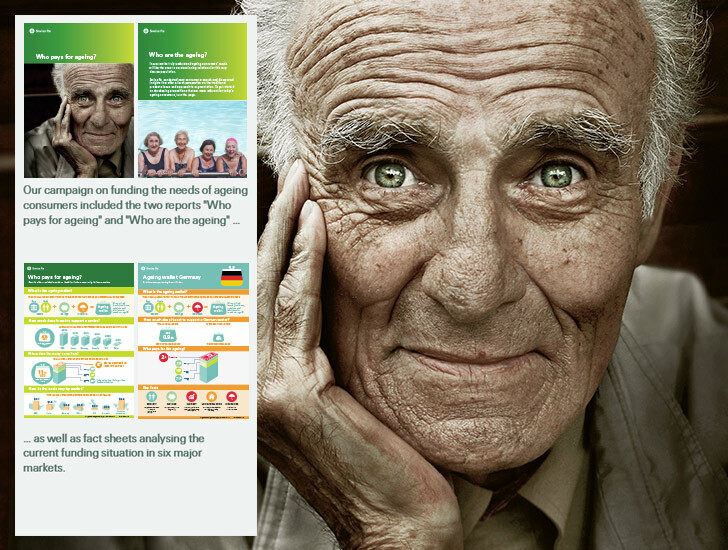 Following up on our research, we have tested a number of prototype solutions with consumers and are now looking for opportunities to develop marketable solutions together with our clients, leveraging our in-depth understanding of ageing consumers.